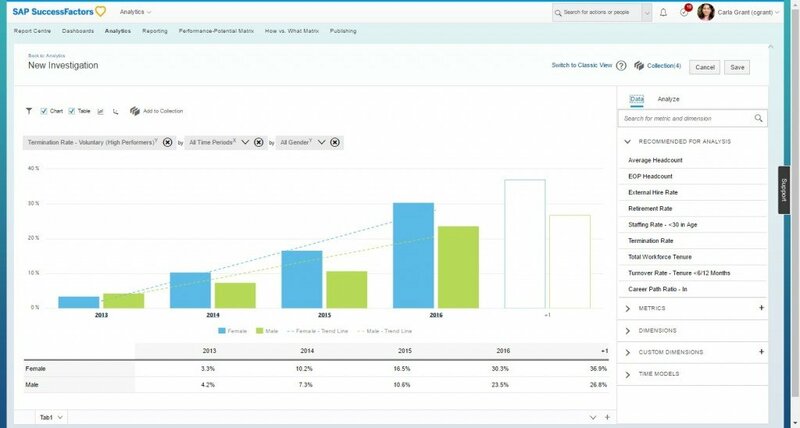 The Workforce Analytics module in SAP SuccessFactors is the final part in our Reporting Series. We will describe what Workforce Analytics is, what you can do with it and compare Workforce Analytics to other SAP SuccessFactors reporting tools. As seen above, 80 to 90% of SAP SuccessFactors customers use reporting for their HR software (including Talent Management). Just 10 to 20% have managed to move beyond transactional/operational reporting into analytics. Using historical trending and analytic models, Workforce Analytics helps users focus on identifying business problems, actual needs while predicting future opportunities and areas for improvement. Jamie Strnisha, Senior Principal Consultant at 3D Results, and I want to prepare you for what is likely to come soon to your organization. 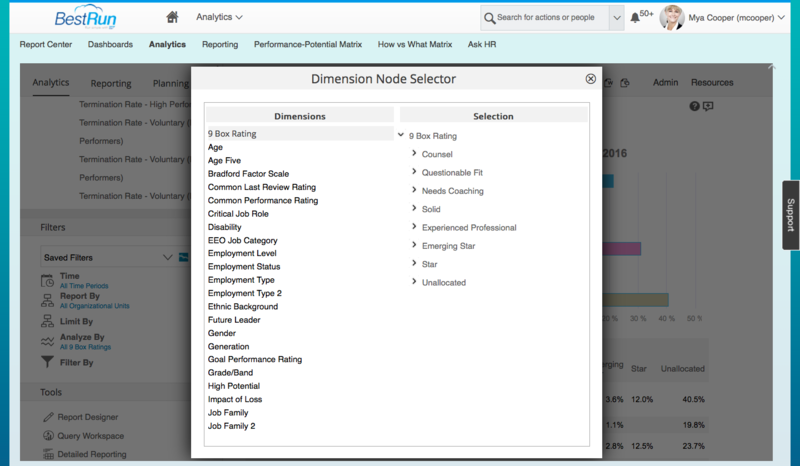 What is Workforce Analytics in SuccessFactors? 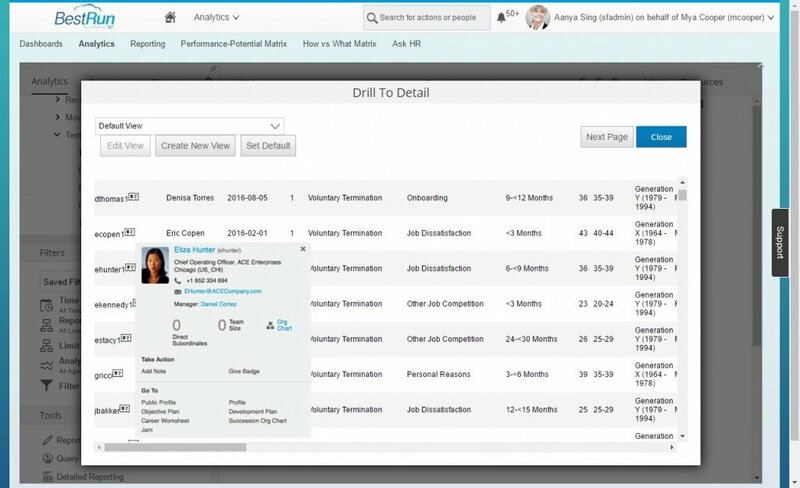 Workforce Analytics (WFA) is one of the modules in the SAP SuccessFactors HCM suite. This module leverages an organization’s data to unlock people analytics potential and insight and provides more capability and functionality than SAP SuccessFactors’ native reporting and analytic tools (as described in my previous series of reporting articles). It helps organizations create effective strategic reports and supports decision making about people with the same rigor, logic and confidence as decisions about money, customers, technology or new business opportunities. SAP SuccessFactors Workforce Analytics provides concrete and actionable insights on workforce data to drive business strategy today and help organizations plan for the future of their people. We would have to write a book to cover all the tools, functions and features in Workforce Analytics, so we’ll stick to the highlights. Don’t hesitate to ask your questions in the comment section or contact one of us directly. One of the key differentiating features for Workforce Analytics is Headlines. Headlines was released in 2012 to provide actionable insight to managers and executives in organizations. Research showed that managers and executives often have a difficult time combing through and understanding analytic data, so SAP SuccessFactors created Headlines to provide simple textual analysis and insight for Key Performance Indicators (KPIs) defined by the organization. Headlines was designed to provide managers and executives with an executive summary that showed hot spots and alerts, delivered via the web and mobile application. 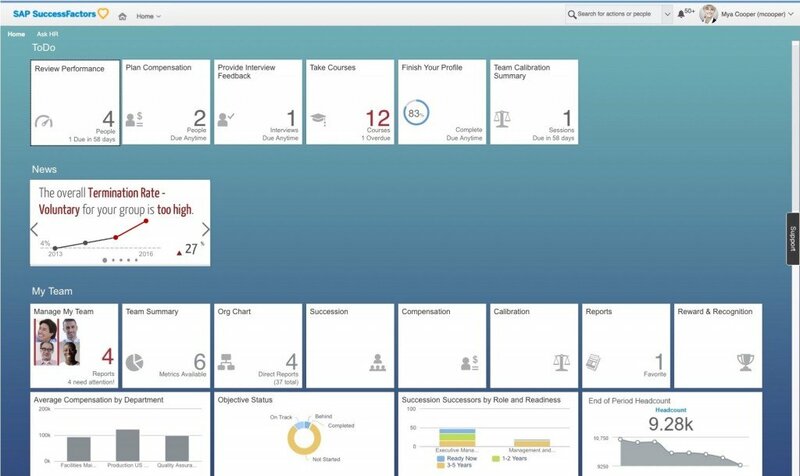 Headlines 2.0 is on the SAP SuccessFactors roadmap for late 2017. 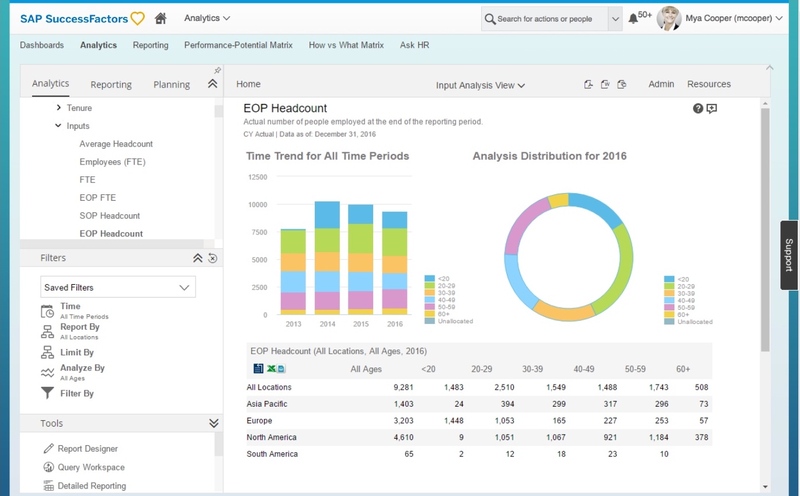 Investigate uses the Fiori design and introduced new functionality. The interface is simple to use and reduces the learning curve for new users. Now, end users can not only toggle between Actual and Annualized data, they can forecast 5 years to understand how historical trends will affect the future. Investigate uses charts and tables to visualize data, and users can perform simple searches to look for particular measures instead of figuring out how they’re categorized. The ability to create and edit custom sets and members continues to be available in Investigate. New functionality allows users to multi-select different nodes of a dimension. Sharing and collaborating with other users is always key to making an impact with data, and while Investigate does not allow for integration with Report Designer today, it does allow users to create and share collaborations. Plans to integrate ‘Investigations’ into Report Designer are on SAP SuccessFactors’ roadmap. The holy grail in analytics is predictive capability. SAP SuccessFactors has some predictive modelling capabilities available in the Workforce Analytics today. At the base level, many of the measures in the tool are annualized by default. This is a straight line annualization formula that allows users to see what the year end number will be if the current trends on monthly basis remain the same. While it may not be as predictive as multi-regression models or take into account seasonality, it does allow customers to see what the future may look like if trends continue as they are. There are also capabilities today in the Analytics Workspace section that allow analysts to run z tests, create scatterplots and simple regression models for demand modelling, and help predict the future. SAP SuccessFactors has always focused on simplifying analytics techniques while still providing enhanced capabilities. Over the next few years, SAP SuccessFactors will continue to focus on expanding the predictive capabilities of the tool, for example, a Predictive Flight Risk model is planned for general availability in Q3 of 2017. WFA also includes several enhancements for the Online Report Designer (ORD), which I described in “Advanced Reporting & Online Report Designer in SuccessFactors”. So I won’t talk that much about ORD, but if you have question after reading the article about ORD, reach out to me). Users interact with data in Workforce Analytics differently than they do with the native reporting solutions. This is because WFA always starts with aggregate data, displayed as measures and dimensions, while still allowing for drill-through and drill-to detail functionality. Measures – Data is displayed as a number. For example, the number of people in an organization (EOP Headcount), the Average Annual Salary (Total Salary/ EOP Headcount) or the Termination Rate (Number of Terminations/ Average Headcount). Dimensions – Allow the end user to break down the data for specific populations. For example, data can be broken down by gender or race. Drill Through – Sometimes SAP SuccessFactors will create multi-level dimensions (called hierarchies) that allow organizations to see the relationship between categorical data elements. The Workforce Analytics module will organize the data and allow for end users to drill through to see how the data aggregates. An example of this would be a supervisor structure, where all data would aggregate to the CEO (which would show the total for the organization), and then the end user would see the Presidents that report to the CEO (aggregate numbers for their respective areas) and so on until the bottom of the structure which are the individual front-line managers. Drill to Detail – Given that Workforce Analytics is an aggregate reporting tool, individual names and details are not necessarily available in the tables, but SAP SuccessFactors has created a functionality that allows end users to click on numbers in the tables to access the details (list of names and results) that make up the aggregate number. While measures and dimensions are the key foundation for how SAP SuccessFactors organizes data, it also uses Metrics Packs.. Each Metrics Pack focuses on a logical grouping of data to support the generation of a related set of measures and categorical breakdowns. Each Metrics Pack is based on a highly structured framework. As an example, the Core Workforce and Mobility Metrics Pack supports the data items required to enable the generation of measures and categories for an HRIS reporting solution. For each Metrics Pack,there is a defined set of source data fields which are extracted from a customer’s HR and other business systems. These items are processed by SAP SuccessFactors’ data transformation, using predefined logic and the customer’s business rules, to generate Base Input Measures and Dimension Hierarchies. These two components form the basic building blocks of any business intelligence solution. Filtering of Base Input Measures by Dimension Hierarchies generate Derived Input Measures. While customers often use Base Input and Derived Input measures for reporting, only Result Measures allow for comparison internally and externally for an organization (benchmarking). The following diagram graphically represents this process. *TalentFlow Analytics Metrics Pack uses the data from the foundational metrics pack implementation, so no new additional data is needed. Data can come from any HRIS. Each Metrics Pack is specifically targeted to provide insights into people analytics. At any time, an organization can move beyond the structured frameworks provided by the Metrics Packs to create a fully customized set of measures and dimensions. Traditionally, most of the Workforce Analytics results have been delivered to end users via ‘pull’ delivery channel, meaning that users have to log into the SAP SuccessFactors site and access a specific report to see results and analytics. Even tools like Headlines require users to access mobile applications to see results tailored to them. SAP SuccessFactors has focused on integrating and making analytics more front and center for end users. New innovations like links to reports via Home Page tiles, Insights Panel, or the Report Center make it easier for users to access data. 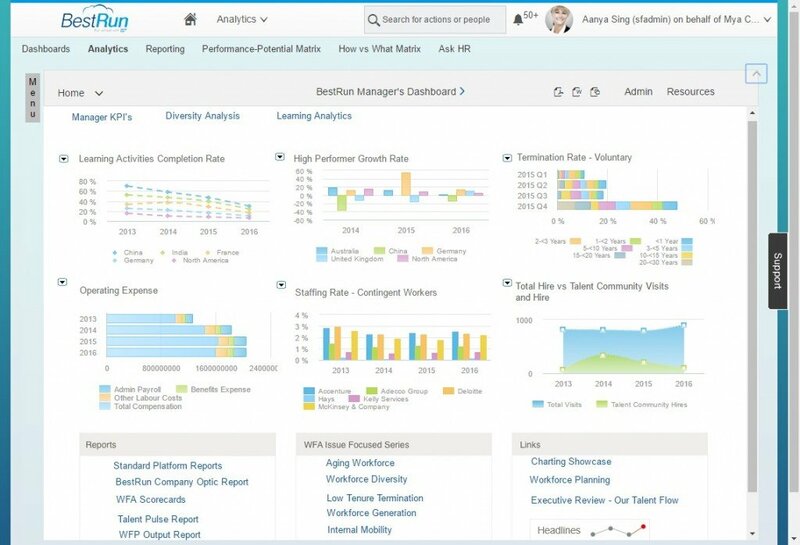 SAP SuccessFactors is also investing in the next generation of Workforce Analytics tiles, and it is expected that Employee Central Workforce Analytics will have access to more trended data throughout the site via the Insights Panel with the Q2 2017 release. Workforce Analytics also allows for a ‘push’ delivery channel via the Report Distributor functionality. Administrators can set-up e-mail bundles in the system and send reports to individuals via e-mail. This can be extremely important for making sure that executives, managers and HR teams get the data they need to make decisions for the organization. Another important note is, that the feature of benchmarking with Workforce Analytics is not available for the European market due to data protection rules and laws. SAP SuccessFactors data transformation employs a modular design to enable organizations to focus analysis and reporting on those areas of people data that are most relevant. We can also surmise from the topics and explanations in this article that this module is not just a reporting tool, which Ad-Hoc Reporting, YouCalc Dashboards, BIRT and ORD are there for. 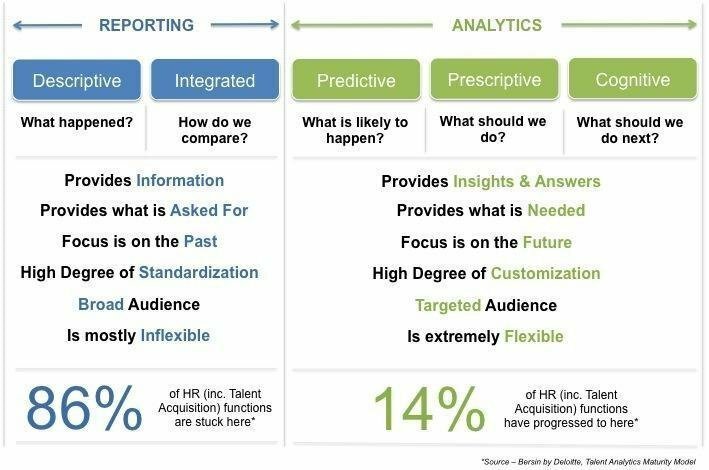 Workforce Analytics’ biggest benefits lie in the tools (e.g., Investigate, Predictive Analytics and Benchmarking) and ORD enhancements that come with it. I hope this gave you a good understanding of the depth and power of SAP SuccessFactors Workforce Analytics. Special thanks to my co-author, Jamie Strnisha, Senior Principal Consultant at 3D Results. She has been working with SAP SuccessFactors Workforce Analytics and Planning customers since 2008. I am very happy she contributed to this article with her experience from many WFAP customer implementation to enhance your understanding of Workforce Analytics. Also thanks to Kourus Behzad, Director – Solution Management for Workforce Analytics & Planning at SAP SuccessFactors, who delivered additional screenshots and Links.